He's not just a catchy name. 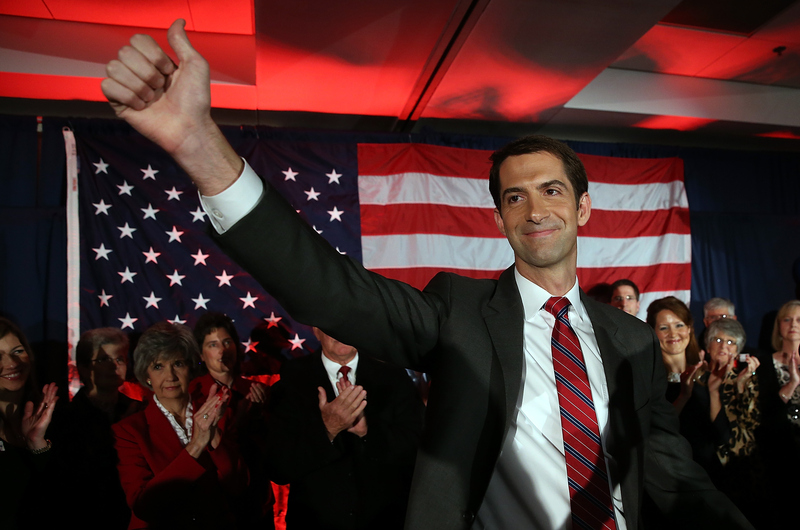 Arkansas Senator Tom Cotton is the GOP's newest celebrity. The young Republican — he's only 37 — is looking to make a name for himself on the national level, and he's doing it quickly. He's only in his third month as a senator, but he's already making major headlines. When Cotton wrote his now-controversial open letter to Iran, warning them not to sign a deal with President Obama regarding nuclear arms, Republicans were elated and Democrats were shocked and appalled. And considering certain things about Cotton — the letter, his voting record, certain political moves, and other shocking statements — it leaves us wondering exactly what Cotton's policies are. It’s time to say enough. Arkansans need a senator who will stand with them and stand up to Barack Obama. That year, Democratic Senator Mark Pryor said of his opponent, "I don’t know who Mr. Cotton’s been voting for but it hasn’t been for Arkansas." And in response to Cotton's letter, Secretary of State John Kerry said he was in "utter disbelief" at the letter, which he said is factually "flat wrong." And, by the way, having graduated from Harvard Law and practiced with a federal appellate judge and two Washington law firms before becoming an infantry officer, I am well-versed in the espionage laws relevant to this story and others—laws you have plainly violated. I hope that my colleagues at the Department of Justice match the courage of my soldiers here and prosecute you and your newspaper to the fullest extent of the law. By the time we return home, maybe you will be in your rightful place: not at the Pulitzer announcements, but behind bars. The only problem with Guantanamo Bay is that there are too many empty cells. As far as I’m concerned, every last one of them can rot in hell. It’s more appropriate for members of the Senate to give advice to the president, to Secretary Kerry and to the negotiators. I don’t think that the ayatollah is going to be particularly convinced by a letter from members of the Senate, even one signed by a number of my distinguished and high ranking colleagues. After analyzing his past voting record, The Atlantic wrote that Cotton has "a harsh, unyielding, judgmental political philosophy, one that makes little allowance for compassion or human weakness." Tom Cotton would be my current idea of someone who should be afforded this opportunity.